ID Image Protector is a program specifically designed to protect your files and photos by providing professional imagine encrypting and embossing facilities. It safely secures and encrypts all of your personal data onto an Imagine, keeping it away from unauthorized access. ID Image Protector is a program specifically designed to protect your files and photos by providing professional imagine encrypting and embossing facilities. It safely secures and encrypts all of your personal data onto an Imagine, keeping it away from unauthorized access. Main Features: - Encrypts files and photos into imagines - Encodes using advanced encrypting methods - Compresses imagines up to 70% - Protects against unauthorized access - Offers help and a tutorial guide Detailed features: - ID Image Protector encrypts various data files, folders and personal data into images, without changing the original content of the files and with no visual alteration. - Protects files, folders and other personal things you wish to keep private. It encodes them is such a way that no third party can break the encoding method and jeopardize your files including spyware or a hacker's attack. - Reduces image-size up to 70% of its original size by the use of an integrated compressing system. 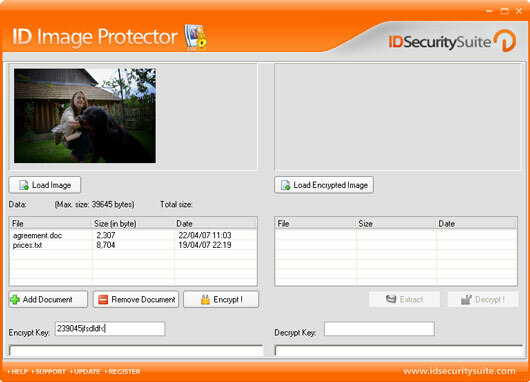 - ID Image Protector uses files, images and strings, as keys for a professional secure encryption. You can select or unselect this option from inside the program only. It safely secures and encrypts all of your personal data onto an Imagine, keeping it away from unauthorized access. Main Features: - Encrypts files and photos into imagines - Encodes using advanced encrypting methods - Compresses imagines up to 70% - Protects against unauthorized access - Offers help and a tutorial guide Detailed features: - ID Image Protector encrypts various data files, folders and personal data into images, without changing the original content of the files and with no visual alteration. - Protects files, folders and other personal things you wish to keep private.